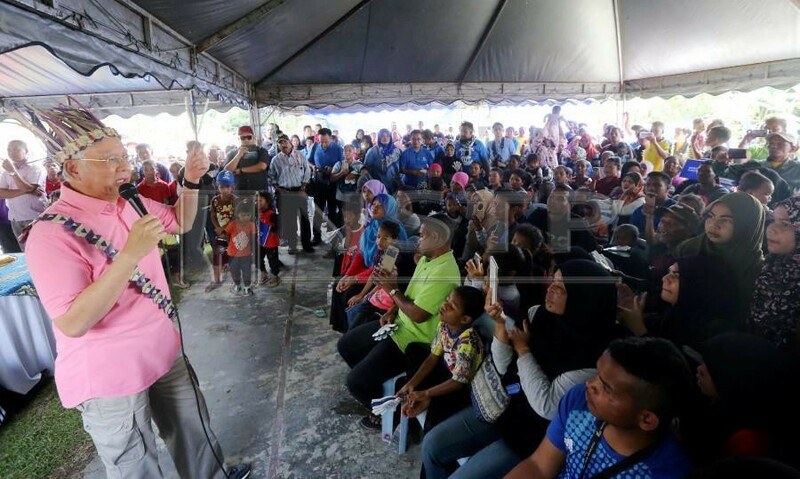 LIPIS: Victory in the Cameron Highlands by-election on Jan 26 will serve as a ‘turning point’ to consolidate Umno and the Barisan Nasional (BN)'s position, said former prime minister Datuk Seri Najib Razak today. He said BN should treat the by-election as an opportunity to revive and rejuvenate Umno along with the coalition as some have gone to describe Umno as a sinking ship. "Enough is enough....voters in Cameron Highlands are already matured and realise the empty promises made by Pakatan Harapan (PH) after winning the 14th General Election. Voters must now ensure BN's win so that it will serve as a turning point on efforts to strengthen the party. "They (PH) have failed to keep to their words and it is time for us to demand their promises...now what are they going to do? oil palm prices have dropped, settlers income have become less...even the living cost allowances for settlers has not been paid for two months. "Do not allow them (PH) to cheat us....now when there is a by-election they (PH) make various promises including development...the promises made in the past has yet to be fulfilled and now they make fresh promises. Do not trust them...how long do we want them to continue cheating us," he said in his speech with Felda settlers at Sungai Koyan Silver Jubilee Hall here today. Also present was Pahang Menteri Besar Datuk Seri Wan Rosdy Wan Ismail and BN's Cameron Highlands by-election candidate Ramli Mohd Nor. Meanwhile, Najib also gave three suggestions to the PH government to assist the Felda settlers who seem to be struggling following the rise in living cost and loss in income since late last year. "My first suggestion if I am still the prime minister, I will set aside RM1billion to settle all the problems including debts faced by the settlers....Felda has assets valued at RM21 billion so it is not experiencing losses as claimed. If there are debts settle it by setting aside RM1billion and do not allow the settlers to shoulder the burden by themselves. "My second suggestion is they should utilise the strong ties with foreign countries to export our oil palm...we have strong relationship with China, use it to ensure oil palm can be sold to major buyers abroad. When I was the prime minister, I discussed with China's President Xi Jinping, and they agreed to purchase (import) additional supply from us....this is the problem when they (PH) cancel projects with China which resulted China to buy oil palm from Indonesia resulting oil palm price here to drop," he said. Najib, who is also the Pekan member of parliament, said his third suggestion was to widen bio-diesel usage as it will bring a positive impact on oil palm industry and Malaysia can expand bio-diesel use since we have a lot of oil palm. 'When (bio-diesel) is used widely, certainly the commodity's value will increase and can help improve the income of Felda settlers. That is why the minister responsible has to do his job," he said. Najib described Felda settlements which were once vibrant and active with activities as now going through a mourning period as settlers were earning very little.